First- to the admins- not sure if you can combine all threads under this. I want to post a final solution since so many people have questions about this!! Okay to finally clarify this issue for all. In all of the following explanations- imagine that the tip of the plug is facing right. TRS- Tip, Ring, Sleeve. The pinout for these connections is: Left Audio, Right Audio, Ground. TRRS- Tip, Ring, Ring, Sleeve. 1. The original TRRS configuration was created by Nokia and has a pinout of Left Audio, Right Audio, Mic, Ground. Apple came along and in typical elitist fashion changed their pinout to Left Audio, Right Audio, Ground, Mic. This is why many apple headsets will not work with android, because the last 2 connections, for Mic and Ground are switched. The issue is with the hardware. The way that songs are skipped (forwards, backwards, and pause) occurs by sending signals down the ground channel (when you tap the button it shoots an electrical signal that the phone will pick up and interpret). The way that volume is increased/decreased occurs by sending signals down the Mic channel. This is why- if you try a set of newer iPhone earbuds on the GSIII- as I have- the center button does nothing, but yet the volume up and volume down both pause tracks, and allow you to skip them!! BIKeINSTEIN, GC736, Encerspay45 and 27 others like this. For OP: I want to thank you for posting such a complete explanation. Sharing your knowledge makes forums like this an invaluable addition. Again, thank you. djdosage and rowentree like this. Do you describe all of the various proprietary Android connectors interfaces as elitist too? Why do you expect Apple to make interfaces for anything other than their phones? Apple is pretty big on sound quality which is why they specify such things. Hmmm, wasn't aware that "..various proprietary Android connectors interfaces..", as it relates to headphones, exist. Examples? What should I be looking out for? no, because they arent elitist in any way at all. There was a standard- that Nokia created. Apple wanted to change it to make everyone have to buy specific accessories for their product. Any and everyone but apple uses the Nokia configuration. I am not sure what you mean- because there is no elitism among android device connectors. I really don't know why the iphone headset did not work with yours s3. The older pinout is named ctia i believe and is used in older phones before 2011 and actual sony xperia phones, and the newer implementation by apple is named omtp. Unfortunately all manufacturers are moving to this configuration, including our very nice galaxy s3 and many others. I am looking these days for an omtp to ctia converter for a headset i bought and i cant find one in Romania. i think the older standard introduced by nokia and used by everyone except apple was named ctia and the newer one from apple is omtp? anyway, samsung is adopting the apple standard. your s3, as well as mine, uses apple's standard and that headset should work with your phone. i am now looking for an adapter to use older version of the headset with my GS3. Please explain how changing the Mic and Ground positions on a headphone plug will do anything at all to the audio quality of a an iPhone or iPod? At the point of the connection you can't fundamentally change audio quality, you can effect quality in the choice of DAC's and other audio hardware but the physical connection of the headset will have little to no effect. It's a damn shame that Samsung decided that the US versions of the S3 didn't warrant the Wolfson DAC that the international version gets, but then again we have LTE (the fact that's it's still useless to many of us being irrelevant) so there's that. So in the context of Apple being 'elitist' in regards to it's proprietary connector, yes they are. Same for the adamant avoidance of the European mandated micro-USB connector. It's Apples way of making the consumer buy into Apples ecosystem and making it more difficult to leave. When your invested to the tune of 4+ Apple chargers at $30/ea. it becomes painful to walk away from that. If you dropped several hundred dollars on highend earbuds that have the Apple standard inline controls, that are now useless on your Android phone that makes it hard to leave Apple. It has nothing to do with 'Audio Quality' and everything to do with keeping customers where their at, in the walled garden. No the Apple headset does not have full functionality on the S3, sorry but it was literally the first thing I tested at the store prior to purchasing the phone. Sure you can listen to music and have limited functionality but you can't control the S3 in similar fashion using Apple inline controls as you can with Samsungs included headset. That's why all major headset manufacturers have labeled their inline controls, typically, with "i" or "a" designating Apple or Android. I just did some tests, while Samsung has done something to interpret the signals from the Apple headset my Nexus 7 sees Apple's earbuds as strictly speakers. On the S3 I can, after launching the app, play and pause a song using Apple's earbuds. On the Nexus 7 I can do nothing at all. Seriously? Nothing in the Apple approach affects sound quality one way or the other. It's typical of Apple to build things that won't interoperate with industry standards. Their USB charging pinouts, for example. And their new connector, which offers to real advantage over micro-USB. What do all of these things have in common? They're unique to Apple, and patented, so they can make money licensing the technology to accessory makers. Anyone can make a micro-USB cable without having to pay a penny to Apple. But if you want to make and sell a cable that attaches to an Apple product, you have to pay your tithe to the great white God. Roll_Cam_Tide and Shanicenicolle like this. Ok, I'm done reading thing on how to get other earphone to work with my S3. 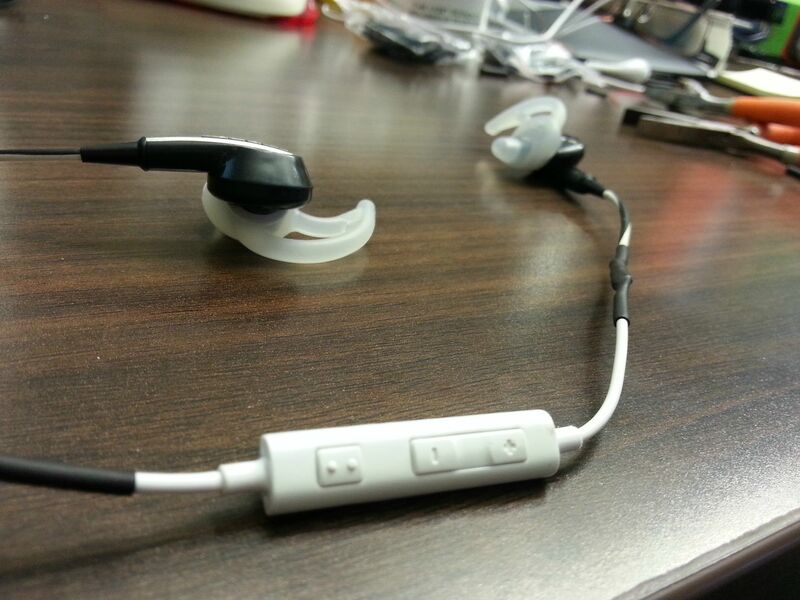 I'll be following this hack Tech Shop 102: Samsung Galaxy S3 Earphone Hack to get what I want. An easier solution may be to download the Llama app and use it's contextual awareness features to trigger things to occur when you plug in earphones. Much less soldering and depending on what you want to accomplish way easier. How to use the Llama app? Can you share the configuration? They should block anything? If yes, then we can make calls with earphones from apple? "Final Soultion" ? . . . . . . is that like the final soul, that you end up with? On the S3 I can, after launching the app, play and pause a song using Apple's earbuds. You can? I checked that out, after choosing the GS3 over a new iPhone, and mine wouldn't recognize anything from my Apple earbud inline controls. Must depend on which music app you use, huh? The config is pretty basic. So simply stated Llama watches the headphone jack and if something is plugged in Llama automatically launches Music Player. This allows me to immediately start using the inline controls to play music without first having to pick an app, also it overrides the default behavior of launching the last audio app. So if you were last listening to a podcast app this Llama action overrides that and always launches Music Player, obviously you can change it to whatever you want. Well I will amend my post to say that the Apple earbuds I'm using are Sony's so it maybe that is the reason, I haven't used actual Apple buds forever. Sorry for the confusion on that. Doesn't matter. Tip is the end, ring is the middle, sleeve is closest to the plastic you grip. Regardless of which way it's pointing. Blue tooth headsets work just fine. So I was doing some dissecting of a busted pair of Bose MIE2i headphones (that worked exclusively only with my Apple products) and my OEM S3 headphones. Turns out this whole "switched ground and mic" thing might not be so. There is a definite difference in the specific ohm resistance for each button press on the controls, the but jack layout is no different between the two. And the transplant is complete. Bose MIE2i now functioning with S3 control. The ground and mic are NOT reversed. So what did you do to get them to work? Just solder the earpieces from the Bose to the wiring / control unit from the S3 'phones? Thanks for the clarity on the pin out for iPhones. I'm hoping you can help me, as I'm still learning here and have looked all over: I have an iPhone 5 that obviously requires a 3.5mm TRRS plug. Meanwhile, I have a mono gaming headset (utilizes both left & right speakers) with a boom mic, and has a female 2.5mm TRS jack for connections. I've tried using a couple different 2.5mm TRS headset to 3.5mm TRRS iPhone adapters, including this one, but the result always is that I can hear the incoming audio from the iPhone on the headset, but the iPhone continues to use its built-in speakerphone microphone instead of the boom mic on the gaming headset. I suspect this is happening because although the TRRS plug is making contact inside the iPhone, the TRS connection on the other side isn't terminating the iPhone mic properly. I assume I would need to construct a cable that has a 3.5mm TRRS male on one end, and a 2.5mm TRS male on the other end, but I'm not clear on what the connections need to be. (again apologies in advance, as I'm still learning).